Squad 4 - Pride of the Northside. Squad 4 will feature its own license plate and graphics...but will feature the MARS Aurora Borealis light bar on the cab roof. Squad 4 was stationed at 1219 Gunnison St. at the Engine 83 House. Production of CFD Autocar Squad 4 will be limited to 300 units. Fire Replicas are designed with the elite collector in mind, and manufactured in limited quantities to enhance future value. Features the MARS Auroa Borealis Light Bar on the cab roof instead of the MARS "football" light. Includes an accessory pack with a stokes basket and 2 rear water cannons, which can be glued/strapped in place. 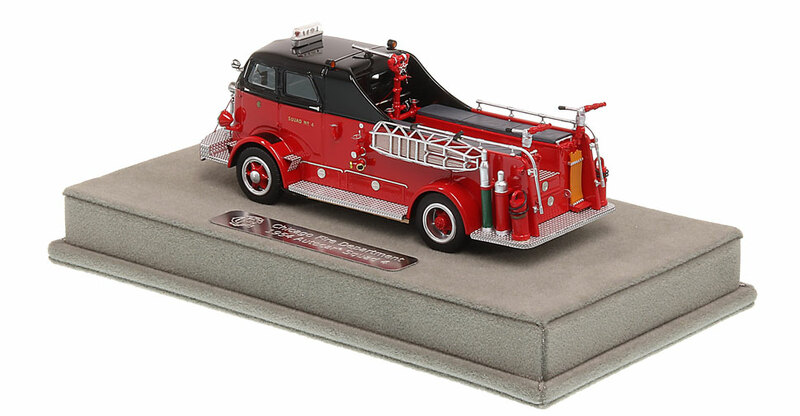 This Chicago Fire Department 1954 Autocar Squad 4 scale model is a museum grade replica. Like all Fire Replicas models, every detail is modeled to perfection and with razor sharp precision. The replica features the specific department configuration and graphics, leaving no detail overlooked. The display case is custom manufactured with high quality acrylic and resin. 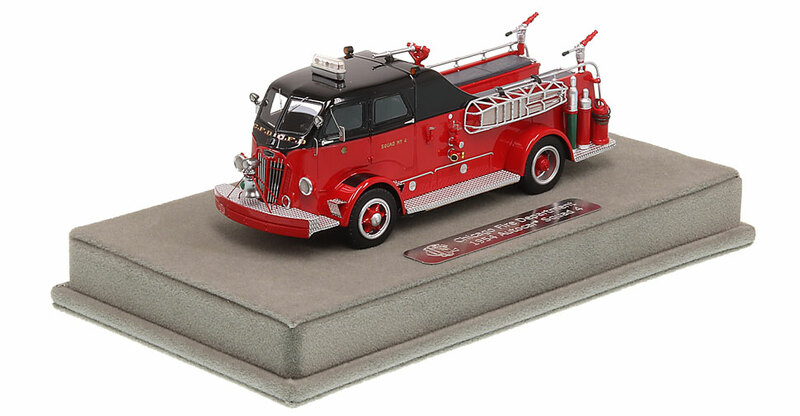 The stainless steel etched plate features the department and truck name, and department seal. This replica is a treasure to be displayed and admired and is in no way a toy. Beautifully done reproduction of this Chicago old classic. Such excellent detail !!!!!!! I cannot wait to see more classics done by Fire Replicas. They definitely bring these back to life!!!!!!!!!!!! Excellent reproduction of the 'Historic' Squads. The workmanship is exquisite. My memory as a very young school boy in the early 1960's was Squad 9 located on the Southside of Chicago at Engine 116's quarters located then at 5259 S. Wood St., these Squads company reproductions bring back the days of my childhood. Unfortunately I missed out on the purchase of the Squad 9 model when offered, but this model serves well. Keep up the GREAT work Fire Replicas! Absolutely beautiful replica!! The attention to detail is great! I wish I was much smaller so I could ride on this thing! LOL!! I have mine sitting on a shelf along with a photo of the actual rig. Excellent and high quality workmanship! Keep up the great work! P.S. A Chicago FWD tillered wooden aerial replica would be phenomenal!! Found the model to be well built. It is an excellent addition to my collection. This model like all your others, I've got 5, is splendid. I hope you make more of the classic trucks. Model is exquisitely detailed. Great showpiece. Autocar Squad 4 best one yet - more, please! A Chicago gem in the history books. I received the model as noted. On time, quality superb, with two exceptions. Now I'm getting picky. Some pictures show the "Stokes" basket attached, when I tried to do that with the tape straps, it fell off within one day. I will say, not a major issue. The (2) two extra deluge pipes had now where to go as there were no pre-drilled holes for them and (1) handle broke off. (I do know that these collector pieces are fragile.) I was able to attach the "Stokes" basket as shown in one of the photos by fabricating 2 "S" hook from a strand of # 16 electrical wire. It will work well. I am proud to own one of your models and be able to speak with on the phone. Fire Replicas has again hit it out of the park with a perfect replica of one of Chicago's most unique pieces of fire equipment. A model none of us dared hope would ever be produced is available as a masterpiece. Thank you Fire Replicas!